Glasgow: Indian paddlers had a decent outing in the Commonwealth Games Wednesday with Achanta Sharath Kamal and Anthony Amalraj winning their respective mixed doubles third round matches before pairing up to win in men`s doubles as well, here. Kamal and Shamini Kumaresan defeated Malaysian combo of Ying Ho and Chee Feng Leong 11-5 11-8 11-8 in the third round. They had spanked Uganda`s Paul Moody Mutambuze and Ludia Magandlen Natunga 11-4 11-4 11-4 in the second round. Doha, Feb 22 : Harmeet Desai entered the final of the under-21 men's singles final beating Brazilian Hugo Calderano 11-6, 11-4, 11-8, 11-5 at the $3.5 million Qatar Open Super Series Table Tennis Championships here. He will meet Frenchman Tristan Flore in the final Sunday. Flore defeated Benjamin Brossier in an all-French semifinal encounter 11-2, 11-9, 12-10, 11-3. Desai's victory Friday night was even sweeter as he accounted for the Brazilian who defeated compatriot Soumyajit Ghosh, the No. 5 seed, 11-8, 11-8, 5-11, 11-9, 11-4 in the quarterfinals. Dubai, Jan 12 - Chinese World No. 1 Liu Shiwen won the women's singles title of the World Tour Grand Final of the International Table Tennis Federation (ITTF) by beating compatriot and World No. 2 Ding Ning here. The final, held in the Hamad Bin Rashid Hall of the Al Nasr Sports Club, began spectacularly in a fierce and tight fight but eventually turned in favour of Liu, who cashed in $104,000 with a 4-2 victory Saturday, reports Xinhua. Liu said that while Ding was a strong competitor, she was lucky as she won a number of key points in the last two sets. Bridgetown (Barbados), Oct 30 : Reigning Wimbledon champion Andy Murray will headline Barbados' Dream Cup opening next month. Organisers say the Dream Cup, into its third year, was started to promote opportunities for young, aspiring Barbadians, through the creation of a world-class tennis event, reports CMC. The 26-year-old Scottish-born Murray, who has agreed to be part of the 2013 event, has been playing for Britain since the age of 12 and is currently ranked number three in the world. Kobe (Japan), Sep 22 : It was a disappointing day for hosts Japan as all their players were eliminated from the 2013 women's table tennis World Cup after Fukuhara Ai and Ishikawa Kasumi both lost in the quarterfinals Sunday. Fukukara was beaten by 21-year-old Wu Yang from China by 11-7, 7-11, 8-11, 9-11, 2-11. Earlier in the day, Ishikawa, the No. 4 seed, lost to Singapore's Feng Tianwei, the No. 2 seed, reports Xinhua. New Delhi, May 17 : Dhanraj Choudhary, secretary-general of the Table Tennis Federation of India (TTFI), was elected to the Board of Directors (BoD) of the International Table Tennis Federation (ITTF) during its Annual General Meeting held at the ongoing World Championships in Paris Thursday evening. New Delhi, May 9 : Soumyajit Ghosh and Mouma Das made the mixed doubles final at the Commonwealth Table Tennis Championships here Thursday, a day on which India made sure of at least seven medals in the individual competitions. Ghosh and Mouma beat top seeds from Singapore, Yang Zi and Yu Mengyu, 11-9, 11-6, 12-10, in the semifinals. They will meet another Singaporean pair, Zhan Jian and Zhou Yihan, in the title clash to be held later in the evening. New Delhi, May 6 : Indian men cruised into the semifinals of the Commonwealth Table Tennis Championships here Monday while the women entered the last four after giving a scare to mighty Singapore. The men paddlers headed by Sharath Kamal won their matches against Northern Ireland, Scotland and Malaysia with identical 3-0 margins to top Group F. Singapore were first in Group E ahead of England, who qualified as the second best team out of four. Qingdao (China), March 18 : Reigning Olympic champion Zhang Jike beat German Dimitrij Ovtcharov, bronze winner at the London Games, in straight games at the Asia-Europe Table Tennis All Stars Challenge. Zhang, the Grand Slam winner, established a 5-1 lead in the first game. Dimitrij fought back and narrowed the gap to one point but still lost to Zhang 11-8, Xinhua reported Sunday. Zhang, 25, won the following two games with 11-2 and 11-9. Raipur, Jan 12 : Soumyajit Ghosh Saturday became the youngest men's National champion at 19, denying India's top player Sharath Kamal his seventh title while Shamini Kumaresan culminated her season on a high note by dethroning Poulomi Ghatak in the women's singles event at the National Table Tennis Championships here. Top-seed Ghosh beat the 30-year-old Sharath 4-2 and took home the Maharaja Pitampura Cup and Rs. 2.30 lakh for his efforts, while Shamini won 4-1 to receive the Travancore Cup and a cheque of Rs. 1.45 lakh. Once again China reaffirmed its dominance in the world table tennis as China won all singles and doubles titles in the 19th Asian Table Tennis Championships at UP Badminton Academy Hall in Lucknow on Sunday. It was all Chinese affair on the last day as expect women's doubles finals all the other finals including men's singles, women's singles and men's doubles were played between Chinese players. The final of the women's doubles event was held between Chinese and Korean girls. The top seeded G Sathiyan has won the junior boy's singles title of Indian Oil National Ranking Table Tennis Championship 2009 after ousting Harmeet Desai in the final match at Gandhidham in Ahmedabad on Monday. The Tamil Nadu boy, Sathiyan defeated his opponent in straight sets by 11-5, 13-11, 11-9, 13-11 to clinch the title. Later in the day, Sathiyan also won the youth boy's title. -10, 1-11, 11-8 to win the men's title. Beijing, Sep. 10 : Former table tennis greats Liu Guoliang and Jorgen Persson have highlighted the need for high profile stars to play a role in reviving interest in the sport among the young. While Former Olympic and world champion Liu said China''''''''s "national sport" retained its popularity among the old, the younger generation was showing less interest. "We should seek different ways to promote the sport at the grassroots level," the Chinese men''''''''s head coach told the China Daily. Swedish former world champion Jorgen Persson shared the same concerns as Liu, his vanquisher in the bronze medal match at the 2000 Olympics. Hamburg - Mountaineers and table tennis fans have played matches on the summit of Europe's highest peak, 5,642 metres Mt Elbrus, the International Table Tennis Federation (ITTF) said on its German-language website on Tuesday. Headed by Sergey Korkin, the vice president of Ukraine's table tennis federation, a 14-strong expedition set off in Dnepropetrovsk on July 14, with nine members eventually reaching the summit on July 31. The expedition website said that Korkin and Viktor Kanunnikov played the first of four matches after installing a special table on the summit. The opening day of the came out with mixed fortunes for the Indian paddlers as morning session belonged to them, while destiny did not favored them in the evening at the SMS Stadium, Jaipur on Wednesday. In the morning, junior girl registered 3-0 victory over Kazakhstan, whereas they lost their match against Thailand by 1-3 in the evening. Ankita Das started the match on a winning note by defeating Margarita Kharechko by 11-8, 11-6, 11-9, while Pooja Sahastrabudhe outplayed Khusseinova Gulchekhra by 11-7, 11-8, 11-1 to register another win. The Tamil Nadu boy G. Sathiyan has outplayed Soumyajit Ghosh to win the junior boys’ title in the South Asian junior table tennis championship played at Sawai Man Singh Stadium on Tuesday, whose roof was leaking even after a grant Rs. 8 lakh paid by Table Tennis Federation of India Secretary General Moolchand Chowhan last week. Sathiyan, who had defeated Ghosh in the National junior final earlier this year, outclassed Ghosh once again in a five setter match by 15-13, 11-7, 11-8, 9-11, 11-8. 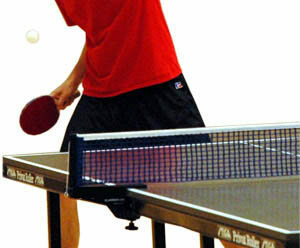 Collegians bunk classes to get a game of table tennis! Table tennis seems to be the favourite sport for most of the college bunkers and those who don't want to waste their money in going out and watch movie in this time of recession. The sports rooms never seem to get rest till the colleges are open as there is always a line of table tennis tables. Students prefer to wait to play the game than to do any other activity. For many, the sport is an activity which keeps them engrossed for more than a couple of hours and say that they don't realise the time while playing.